"During the reigns of Emperor Antoninus and his son, Marcus Aurelius, St. Abercius was the bishop of the city of Hierapolis in Phrygia. The great majority in this city were pagans, and St. Abercius governed his sparse flock, sorrowing in his heart because of the great number of pagans and idolaters, and diligently praying to God that He would bring them to the light of truth. During a boisterous idolatrous festival, Abercius became inflamed with God's zeal and entered the idolatrous temple, smashing all the idols. When the enraged pagans sought to kill him, three young madmen, foaming at the mouth and howling, fell down before this man of God, and he drove the demons from them. The young men became sane and calm. This turned the pagans' anger into amazement at the wonderworker of Christ, and five hundred of them immediately desired baptism. Little by little, all of Hierapolis came to believe in Christ and were baptized. The proconsul of the province, Publius, had a mother who was blind. Abercius restored her sight by prayer, and Publius, his mother and many others believed in Christ. In old age, Abercius was summoned to Rome, where he healed the emperor's daughter of insanity. The Lord Jesus Christ appeared several times to His faithful follower. People from near and far came to him for miraculous help when they suffered from incurable illnesses. The demons not only feared him, but also served him at his command. At the guidance of the Lord Himself, Abercius preached the Gospel throughout Syria and Mesopotamia. 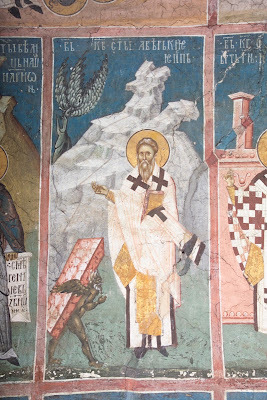 In great old age, St. Abercius presented himself to his beloved Lord in Hierapolis, at the end of the second century."